Call of Duty: Black Ops 2 expansion announced – prepare for a Revolution! 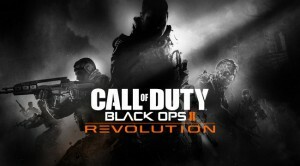 Activision have today announced the upcoming expansion to Call of Duty: Black Ops 2, called Revolution. While it does check the boxes expected of an expansion, offering new multiplayer and zombies maps and a new weapon, it also adds a twist by letting players turn on each other in a new zombies game mode as well. The “Turned” mode has players-as-zombies attacking a solitary human survivor; if you manage to chow down on them, you then become the survivor yourself, trying to fight off the other zombie attackers for points. Moral angst over having divided loyalties isn’t mentioned. Among the other content, the new weapon called “Peacekeeper” is described as being halfway between an SMG and an assault rifle – hopefully not being overpowered when playing against players who do not have the expansion pack. The new maps essentially provide a world tour, allowing you to shoot friends and foes on four different continents – “Downhill” being a ski resort in the French Alps, “Hydro” is located in a dam in Pakistan, “Mirage” places you in a derelict luxury complex in China’s Gobi Desert, and “Grind” is in a skate park in California. Of the four, Grind is perhaps going to challenge conventional gameplay the most – due to the number of curved edges, there are few places that allow wall hugging to provide as much cover as many maps do… whether this will inspire players to try new tactics, or result in it being voted down regularly remains to be seen. Finally, the new zombies map “Die Rise” has the unlikely description of having “Escher-esque scenarios” (“in parts, players may not be able to tell which side is up and which side is down”, according to Dan Bunting, the game’s Online Director in the expansion trailer). Hopefully, this will make it an entertaining environment to keep returning to, rather than just confuse players into falling down the open liftshafts – the layout is described as being vertical, running through an abandoned skyscraper. Call of Duty: Black Ops 2 – Revolution is described as being the “first of four epic DLC events” with the others presumably to follow throughout 2013. It is released for the 360 on January 29th but follows later for other formats, and is expected to cost 1,200 Microsoft points (approx UK£10.20/US$15).